“Very professional operation. This is who you want to call when you need a job done quickly, the right way the first time, and you don't want to mess around with cut-rate unreliable contractors. These guys are the real-deal, like something you would see on HGTV! They made sure our permits were in place, requested drawings and plans in advance, performed a walk-through, a few days prior to the day the work was to be done to match the plans, and he came-by the day before to make sure all of the fixtures at arrived. On the day of the job, they arrived on time with the plans in-hand. Like a true project manager, John brought in a team of skilled workers. He quickly instructed them on each of their jobs, and they jumped to work. John performed oversight of each group of workers as they went along, and he checked each of their jobs when they were finished. This massive job was completed in only about 4 hours. The building inspectors came in the next day, and everything passed inspection. Since we had several contractors there simultaneously, they made sure to keep their work spaces to a minimum, and never had tools and materials strewn about. They cleaned everything before they left. “You did a first rate ob of rebuilding my carport destroyed by fire. service was fast, flexible and high quality.” – Alan W.
“ I would recommend John and his crew to anyone who needed construction work done. His work is of the very highest quality. John is also very responsive to phone calls or email questions of any kind and always answers quickly. He and his crew were also very neat and kept my yard and home area always cleaned up after work was done. Great job John!”- Betsy C.
“No words can express my appreciation. Thank you.” - Kathy Z. “I appreciate your great service and reasonable charge.” - Sam H.
“It was a pleasure working with you. We appreciate your promptness, professionalism, and high quality standards.” - Diana & Greg H.
"Everything outside looks GREAT! The railings make all the difference on the porch area...at least to me! So much nicer than the old black, rusting iron skinny railings. You picked out a great match for the house! As I stated in a previous email, everything looks and works great inside...the bath fan and the attic stairs. And now...the BIG difference with the front stoop, cleaned up nicely...I can’t say enough good about you. AndrewZ Home Improvement is definitely in my phone book for future reference, and I will recommend you to neighbors/friends who are looking for home improvement work." "The experience using AndrewZ Home Improvement was wonderful. We cannot say enough good things about this company. They were efficient, professional and created a cozy new home for us. The work was excellent and no detail was overlooked. I would also like to mention that we obtained a rehab loan and the bank was difficult to deal with (to say the least), and through the entire process, AndrewZ was patient with us and the bank in waitting to get paid in draws AFTER the work was completed. They completed the job in a timely manor and even beat their deadline for us to move in. John, the owner of AndrewZ, added many wonderful extras tailored to our families wishes. He even added a special "hidden door" in the front closet linking to my son's bedroom because my son wanted that area to remain open. He added beautiful columns to our basement (going above and beyond what we expected). We asked them to leave our storage area unfinished in the basement and John wanted this area to be nicer so he took it upon himself to paint the unfinished concrete for us so we had a nice place to put all of our storage items. They cut custom sized trim to match the interior trim that had originally been with the job. All of our windows and doors were custom because the openings were from the original house. Many people continue to comment on our gorgeous windows and trim surrounding them. The added luxury of tile and granite were made affordable and recommended for longetivity by AndrewZ and we are so thankful we took his advice. 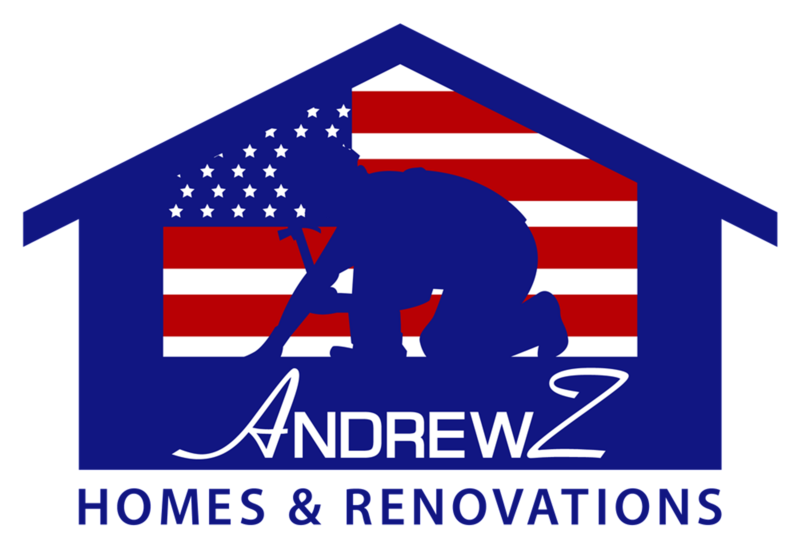 We highly recommend using AndrewZ Home Improvement for any of your remodel needs! Communication was professional and they were always quick to call us with any questions or concerns. Our home is more beautiful then we could have ever imagined possible. Thank you AndrewZ Home Improvement! We will call you for sure in the future when we are ready for an addition on our amazing new home." -Patrick & Sara M.
Would you like to leave feedback or a testimonial? Use the form below. We would love to hear from you!